From left are members Chrissey Henry, Juanita Murphy, Sarah Katherine Ahrens, Kim Johnson, Sharon Gahagan, Sandra McCullen, Marian Keator, Sarah Luster, Gail Hines, Margaret Berry, Kay Foshee, Cynthia Brown, Rita Kaye Breedlove and Charlotte Cross. Photos by Hannah Richardson. The St. Denis Garden Club hosted its 60th Anniversary Floral Show with guests Tuesday, March 19. The historical Cherokee Plantation housed members’ gorgeous floral arrangements, strategically placed in certain rooms throughout the main house. Several members worked on their arrangements the previous day at Jeanne’s County Gardens. Members arranged their bouquets while keeping their assigned rooms and placements in mind. The St. Denis Garden Club was founded in 1959 by Thelma Mitchell and its first president was Conna Cloutier. The current president is Sarah Luster. They meet monthly and enjoy listening to guest speakers, usually on the topic of gardening and floral arranging and going on trips. Juanita Murphy’s arrangement consists of lilies, seeded eucalyptus, coffee beans, blue delphinium and mini daisies. Kim Johnson had sweet heart white roses, seeded eucalyptus leaves and fern leaves in her arrangement. Sarah Katherine Ahrens placed blue hydrangea, yellow tulips, ruscus in her mother’s candelabra. Rita Kate Breedlove primarily used pink roses, white hydrangea and coffee beans in her floral arrangement. Charlotte Cross used white roses, seeded eucalyptus, coffee beans and curled leaves in her floral arrangement. Margaret Berry primarily used roses, goldenrod, yellow daisy, a curly willow branch and accented with a cute bird nest. Chrissey Henry included snowball hydrangeas, geranium, thistle, bells of Ireland and snapdragon in her arrangement. It was placed outside next to the front door of the plantation and was this first one guests saw as they signed in. Cynthia Brown used white roses and coffee beans, placed in a vase that compliments the wall in the background. Kay Foshee’s floral arrangement included ruby snapdragons, green hydrangea, blue delphinium, coffee beans, cluster roses and green wreath. Sandra McCullen used garden and Valentine’s Day roses, blue delphinium and thistle in her floral arrangement. Gail Hines included red roses and fern leaves in her arrangement. Sharon Gahagan and Sarah Luster created the floral arrangement that served as the centerpiece for the appetizer table. It consisted of white hydrangeas, yellow roses, iris, dogwood, fern leaves, mint, rosemary, delphinium and monte christo. Marian Keator took inspiration from the gardens of colonial women in her arrangement, adding red lilies, geranium and witch hazel, placed in an antique vase from Galveston, Texas. Her arrangement also made in memory of the first president of the club, Conna Glass Cloutier, whom she has many fond memories with. The food table had several delicious appetizers for guests. 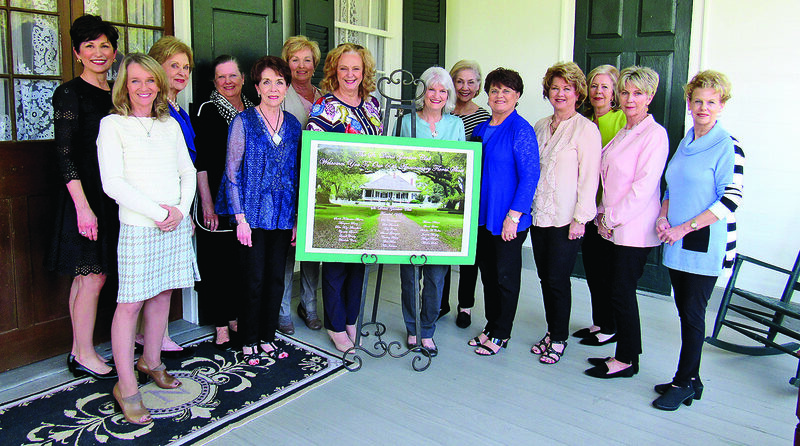 Garden Club members and guests visit on the front porch of the plantation house. KA fraternity volunteers escorted guests such as Ann Gilmer. Tommy Whitehead sits in a rocking chair on the front porch.